When people watch air shows like the recent "Red Tails Over Montgomery," odds are they have no idea what the pilots above them are going through. "It's about the busiest you'll ever be in your life," said Capt. Don Roney of the 187th Fighter Wing. He's an F-16 pilot, but for Red Tails Over Montgomery he's the air operations officer in charge of making sure the flying goes off without a hitch. The flying for this free air show takes place at Dannelly Field, 5187 Selma Highway, the Montgomery Air National Guard base that's home base of the Alabama Air National Guard 187th Fighter Wing. "Unfortunately, I drew the short straw, so I get to be in charge, rather than fly airplanes," Roney said. As a pilot, he's more than aware of the extreme conditions and responsibilities that go into flying an F-16. There's not much of anything to compare to flying one of these aircraft. It demands constant attention, and incredible stamina just to stay conscious up there. "At times you're listening three radios," Roney said. "You've got various instruments that you're monitoring for the health of the aircraft. Your flight instruments. Keeping yourself away from other airplanes and keeping yourself away from the ground." The F-16 is incredibly fast down low, though conditions at that height are bumpy. "You could do up to 800 knots (that's just over 920 miles per hour) for an air show. That is moving," Roney said. Somehow, pilots have to "stay ahead of the jet" in their thoughts, Roney said. "You've got to be thinking 10 miles a minute almost that you're doing, planning out your maneuvers," Roney said. Going that fast takes an incredible toll on both body and mind, mainly because of the gravitational forces (g-forces) during flight. "Right here on the ground, we're at 1G right now. That's the force of gravity," Roney said. "Imagine nine times that. If you're a 200 pound individual at 1G, you actually will weigh 1,800 pounds at 9G. Imagine the weight of your arms and the weight of your head and the weight of your body, and the blood trying to be forced out of your head. It's trying to black you out and, quite frankly, kill you. If you black out that low going that fast, you're going to hit the ground very quickly thereafter." Roney said it's also really hot inside an F-16, between the fire-retardant suit, helmet, gloves and oxygen mask. "You're sweating, and you've got a g-suit squeezing you," Roney said. 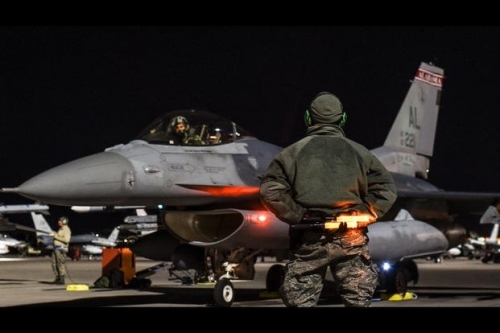 He said it takes a lot of training for an F-16 pilot to be able to execute duties with all that gear on. "Thankfully, we've got a lot of training behind us, and it's going to be a safe and a fun airshow," Roney said. One of the major reasons for the air show is to give thanks to Montgomery for their support in getting the new F-35A aircraft coming to the 187th. The new aircraft means new training, something Roney and others will be going through sometime after Saturday's air show is done. "They will go down either to Eglin or to Luke Air Force Base, and they will convert to the F-35," Roney said. "I think that transition course, we call it a TX course, is somewhere between six and nine months of training that we'll have to go through to get qualified on the jet." After that, they'll come back to their home unit and continue seasoning on the F-35 Lightning II. "You're talking about a multiyear process to completely convert over to the F-35 and be ready to go into combat again," Roney said. "But it's an exciting time. I know there's a lot of guys that will convert over to it and are definitely excited about it, that's for sure." � Copyright 2018 The Montgomery Advertiser.